Hotel Description: Playa de Oro Varadero is located just 5 km from the center of Varadero on the seafront next to the Dolphinarium, this hotel has two separate buildings, one of four floors and the other of six floors. The whole complex is built around two connected swimming pools. This modern concept is surrounded by tropical gardens. Our all-inclusive package includes all meals, soft and alcoholic local and international drinks, entertainment and all non-mechanized water sports equipment as well as an introduction to Scuba . Initiation Dive Is Free. Address: Carretera Las Morlas, Km 17.5, Varadero. Matanzas. Cuba Number of Rooms: 385 Distance to Airport: 35 KM All Inclusive Plan Property Amenities: Bar, TV Room, Tennis, Garden, Parking, Medical Services, Tour Booking Desk, Swimming Pool, Lifts, Conference Room, Restaurant, Business desk. 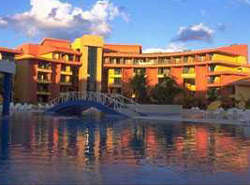 Playa de Oro Varadero - Room Standard Room 385 rooms including: 261 twins rooms, 110 double rooms, sea view in 150 rooms. All rooms with terrace, minibar, bathrooms with bath & bidet, satellite TV in six languages. Air Conditioning, Phone, Satellite TV, Safety Deposit Box, Hair Dryer, Radio, Minibar, Private Bathroom, Balcony or terrace, Twin beds, Power 110V/60Hz, Cold & hot water, Alarm clock radio Check In Time: 2:30 PM Check Out Time: 12:00 PM. Check our Cuba Hotels in Varadero and all over the country. 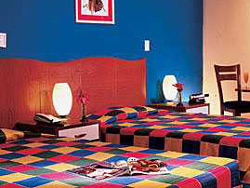 Visit our Hotel in Varadero and safe online. No reviews for Hotel Coralia Club Playa de Oro yet.